In the pre-modern era when scientific development was limited, Shamanism governed Korean society. Modern science reveals that past methods were not necessarily unscientific, as they had their own benefits. However, it’s clear that the knowledge and awareness of pre-modern people were very different from those of today. More than most countries, Korean people believed in a variety of gods. They thought that things they could not see, and things they could not manage by their own abilities, were caused by the control or blessing of the gods. For example, in the house, Korean people believed that there were gods on the site, in the master bedroom, the kitchen, the pots, the storehouse, and the toilet, hence there were rituals for each of these gods. If you went outside the house, there were cheonsin (gods of the heaven) in the sky, jisin (gods of the earth) in the ground, sansin (mountain gods) in the mountain, and dongsin (village gods) in the villages. At the village entrance acting as guardian spirits were the sinmok (a large sacred tree), the nuseokdan (a mound of rocks), and the jangsin (tall gods) or sotdae (a pole signifying celebration and prayer for a good harvest). It was believed that outside the village, the spirits that couldn’t go to the afterlife and the gods that transmitted smallpox and other contagious diseases watched for an opportunity to go after the residents. The role of each of the gods differed slightly. Mountain gods or village gods protected the peace of the village, the high gods had the important role of listening to individual prayers, and the sinmok or the jangsin kept away misfortune and evil spirits, acting in the role of a gatekeeper. Regardless of the gods, in the past the Korean dynastic kingdom of Joseon (1392–1910) made roads that connected the capital and the provinces together, with signposts erected at regular intervals. There was a system of providing restaurants and accommodation for the convenience of government officials and travellers. The signposts that were erected at this time were called jangseung. Whenever there was a war, a sudden change of weather, or an outbreak of contagious disease, people suffered or died. At this time, the scariest god in Joseon was the mamasin—the smallpox goddess. Before the introduction of vaccination, the people of Korea lost many children due to smallpox. Therefore, they were more scared of the smallpox goddess than of any other god, and conducted many rituals to stop the mamasin. The Joseon people believed that the mamasin came from the south of China and went through the north of the Korean Peninsula to then be dispersed throughout the whole country. They believed that the mamasin could use the signposts to find the houses with children inside, so they carved a scary face of the jangsin (god who protects the village) on the signposts to drive out the mamasin. Additionally, they drew pock marks on the face of the jangsin at the entrance to the village as if the jangsin had been infected with smallpox. And as a part of the 1894 reforms, Joseon abandoned the old system and through the adoption of the Western postal system, government-run bases and totem poles disappeared quickly, and now only their names have been passed down. 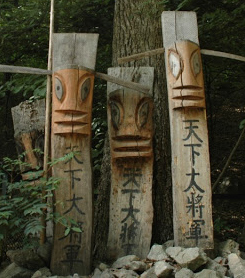 However, the jangsin that protected the villages are still maintained by the villagers, and the villages that used to call the gods by different names now call them jangseung, or totem poles. Today, there are still many villages who erect the jangsin and hold ancestral rituals. 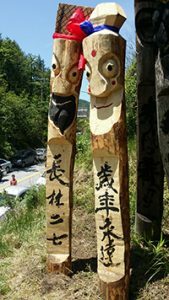 The jangseung retained its purpose as a signpost, either to promote tourist areas or in its original meaning of preventing bad things from happening, and now it is used symbolically at various citizens’ campaigns or resistance movements. The first time I encountered the jangseung was in 1988. At that time, Korea was in an unstable political state and in 1987 the entire nation had fought for the establishment of a new political system, the direct presidential election system. However, the newly appointed government was only successful due to a rigged election, so there was continuous conflict between the government and student protesters. The existing forms of university festivals changed and ‘Koreanised’ as traditional content appeared. During this period, the traditions that had been passed down from the villages, such as tug of war, pungmul (percussion band music), or the jangseung festival, became the mainstay of university festivals. 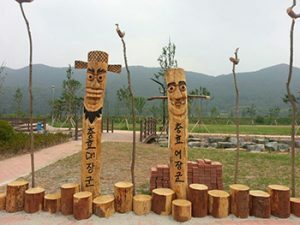 The jangseung traditionally had the function of protecting villages by blocking bad energy, and it became a piece of traditional culture that was popular with students, because the students’ opinions could be carved on the body of the pole. At this time, the university jangseung didn’t have road signs on them, but instead bore messages that the students were advocating, such as “The people come first!”, “Unification first!”, “Liberation first!”. I was majoring in sculpture when I came to carve a jangseung in 1988 at YoungNam University, which formed my connection with jangseung and since then I have been both carving and researching them. While I was writing my master’s thesis, I found out from my research that jangseung are now being used for four main purposes. Firstly, for hundreds of years, the jangseung that were erected with the purpose of protecting the villages as the jangsin are still being preserved. Secondly, jangseung are used to claim traditionality and to promote tourist sites. Thirdly, jangseung are used by social activists as a way to express resistance against political or environmental problems, for instance at universities. Finally, there are jangseung that are produced by applying the idea of traditionality as the subject to create works of art. In the world, from the past to the present, wood or stone monuments have been erected with a purpose in mind, but now it is undeniable that globally, these forms of culture are declining. However, Korea is preserving and producing this culture more than most other countries. There are similarities and differences between the Korean jangseung and the totem poles that are found in North and South America and Oceania, and I think that more research needs to be done on these cultural differences in the future. As part of Korea Day 2019 Jinsik Kim will be on University of Sheffield Campus on 10th March 2019 for a live carving of two giant traditional Korean totem poles, which will become a permanent feature of our campus.